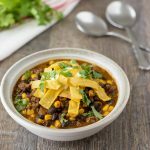 This Beef Tortilla Soup is made in the slow cooker and features a secret ingredient that adds a ton of flavor. So easy to make and delicious! The secret to this soup is the enchilada sauce. It’s a simple way to add a ton of flavor. Make your own homemade enchilada sauce ahead of time or use a good quality store-bought one in a pinch. It’s a delicious and easy soup recipe that you will want to make again and again! Today, I’ve decided to share something very personal that’s been going on in my life. My father was diagnosed with cancer towards the end of last year. He’s completed his first round of chemo and radiation treatments and last week he had surgery. He is still currently in the hospital because the doctor wants to take things really slow. We were thinking that he would be in for three to five days, but we’re seven days in now. The good news is that he is doing pretty well, all things considered. The surgery went really well, and he hasn’t had a lot of pain. So incredibly thankful for that! It’s so tough to watch your parents go through things like this. I’m writing this on Wednesday, and as of right now, we’re not sure exactly what day he’ll go home. Unfortunately, it looks like he’ll be in the hospital on his birthday this Friday. 🙁 I would really appreciate your prayers for my dad as he battles cancer. I’ve made this soup recipe three times in the past two weeks. Two of those times were testing the recipe, and I made it again this past Sunday. It was really nice to come home to this amazingly good Beef Tortilla Soup after being gone all day. I took some to my mom, so she’d have some real food to eat at the hospital, too. Healthy food options are very scarce in hospitals, which is really sad. She really enjoyed having some real food to eat! My Homemade Enchilada Sauce really is what makes this super easy soup tastes so incredible. You can make it a day or two ahead, and use it when you pop this into the crockpot. It adds so much flavor without a lot of work. A good quality store-bought sauce can be used in a pinch. 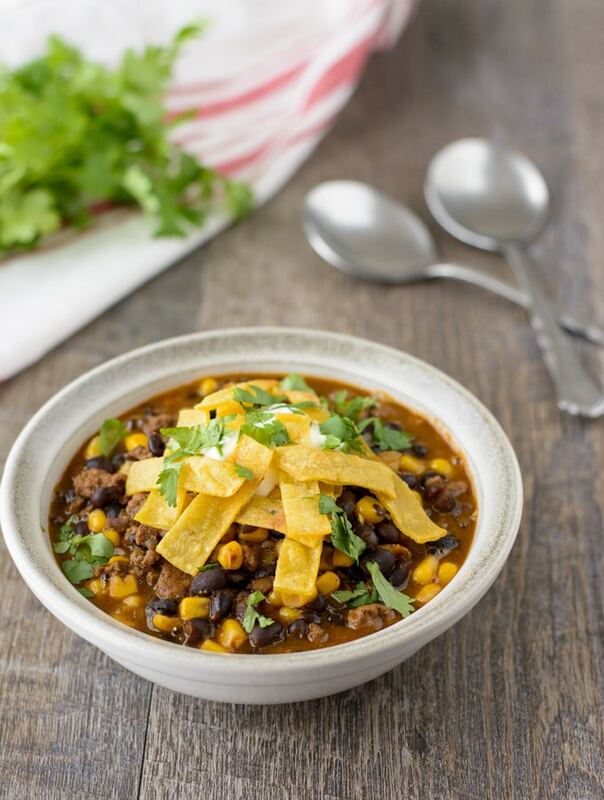 Of course, one great thing about this Beef Tortilla Soup is that the crock pot does all the work for you. I tested this on the high and low setting of my crock pot. Soups like this are just about always better cooked low and slow, and I really prefer the slow setting results. However, they both yield delicious results, so use whichever fits your needs best. I topped ours with some fresh cilantro, fried tortilla strips, and sour cream. Some shredded Monterey Jack cheese would also be delicious with this! Heat the oil over medium-high heat. Add the beef and let cook, breaking it up with a spoon or spatula as it browns, 4-5 minutes. Reduce heat to medium, add the onion to the pan and cook, stirring occasionally, until soft, about 6-7 minutes. Drain any excess grease from pan. Transfer the meat/onion mixture to your crockpot. Add the seasonings, enchilada sauce, beans, corn, then stir to combine. Cover and cook for 4 hours on high or 8 hours on low. Stir in the cilantro, then portion out into bowls and top with your choice of toppings.